Interactive and Charming: with 5 colors in 4 modes.Choosing the color you like,you will burst with popularity. Safe and Stable:Low color temperature,no harm to your eyes. 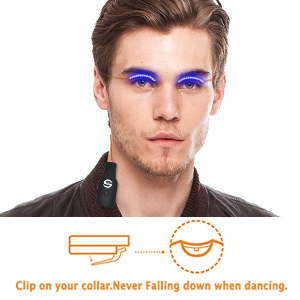 Just take it as part of your eyelashes, dancing as normal. 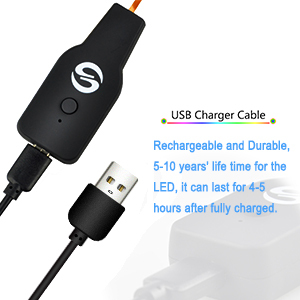 Rechargeable and Durable:Up to thousands of USB charging times and 5-10 years Led life.It can be used for 4-5 hours when fully charged. Easy to Attach and Remove:Using the lash adhesive for seconds and stick it on your eyelid.Then clip on your collar.Press the power button to turn it on or off. Multi Occasion Application: Perfect for all kinds of Party, Bar, Night Club, Concert Stage,Shows,Halloween,Christmas,Birthday Gifts.Just Own it,Catch Everyone's attention. 1. 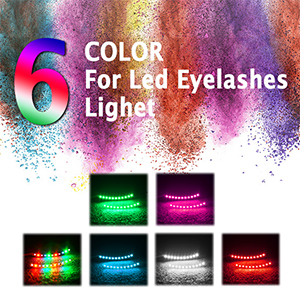 4 LED MODE CHANGING-UtechSmart led false eyelashes with 5 colors in 4 modes.Colors are:Blue,Red,Pink,White,Green. 2. 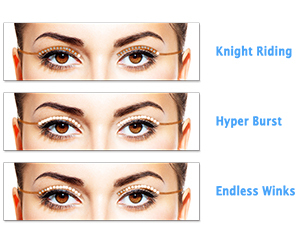 USB CHARGE-UtechSmart Led Lashes is rechargeable.And it usually works for 4-5 hours. 3. SAFETY WORKING-Microcomputer program control,low color temperature,no heating up. 4. EASY USE-Easy to stick and remove the LED eyelashes. 5. LIGHTWEIGHT- Only 15 grams, free to enjoy your dance. UtechSmart LED Eyelashes come with a usb charging cable, which is rechargeable. It can last for 4-5 hours after fully charged. So you can dance with them in the whole party time. 1. Press the button to start them,then LED continues to light up from Endless Winks, Hyper Brust, Knight Riding. 2. Press the button one time,Endless Winks model turns up. 3. Press the button one time,Hyper Brust model turns up. 4. Press the button one time,Knight Riding model turns up. There are 6 colors are avaiable. Blue, Red, Pink, White, Green, Multi-Color.You can choose any color you like.Each color will give you a different feeling. 1. Open the box, take out the led eyelashes. 2. Use disposable adhesive papers or false lashes adhesive to stick and fix the led eyelashes to your eyelid. 3. Clip on your collar. 4. Press the power button to turn on, starting the first mode. 5. Pressing again,it changes to the next mode.